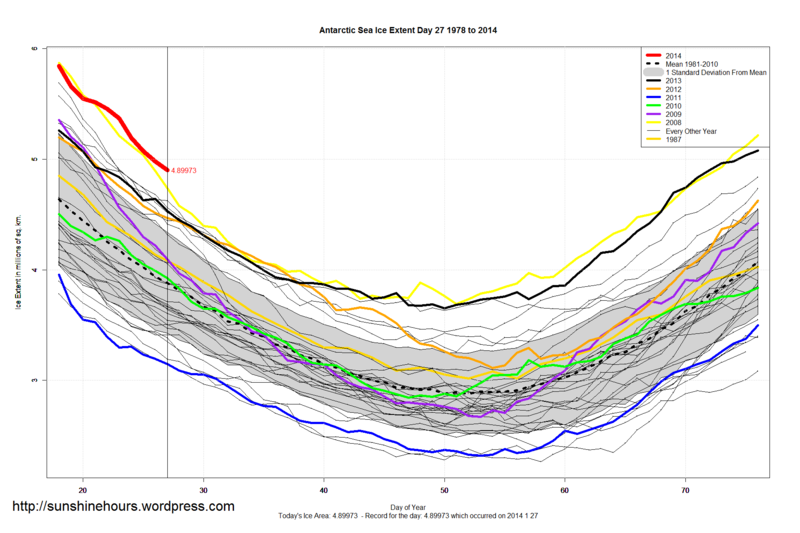 Antarctic Sea Ice Extent is very much on track to have the highest minimum in the modern satellite era. The highest minimum was in 2008 at 3.69176 million sq km on day 51, The 2nd highest was in 2013 at 3.65040 million sq km on day 50. The earliest minimum was day 43 in 1994. And the latest minimum was day 65 in 1986. Antarctic Sea Ice Extent as of Jan 27 2014 was 1 million sq km above the 1981-2010 mean and 160,000 sq km above 2008. Day 27 was the 10th daily record of the year. I do not like the angle that the Ice extent is taking, that could be quite frightening. I know it would one in the eye of the Warmists, but it is rather worrying. Cooling southern ocean keep Antarctic sea ice level high.